As peasantry is increasingly stopping growing rice, the general trend is the conversion of paddy fields into apple orchards. Now the high-density has added to the elite-farming fashion. But a section of farmers still follows the traditional wisdom. They opt for vegetables which, in comparison to fruit, require less investment, had a huge local market and have quick returns. There are areas which now survive on vegetables and habitations closer to the major markets make the best of it. Bangidar is one such village in Islamabad district that thrives on vegetable cultivation round the year. Located barely 15 minutes walk from the main town, Bangidaar is a vast space, perpetually green, on the other side of the wooden bridge. With small good houses scattered in the lush green vegetable fields on both sides of the road, the village seems as if it is readying for a romantic film shooting. There is a fragrance in the air as butterflies swarm the open blue skies. Bangidar is an address for the bulk production of vegetables in the belt. While part of it goes to the local market, the village even exports some of the production. 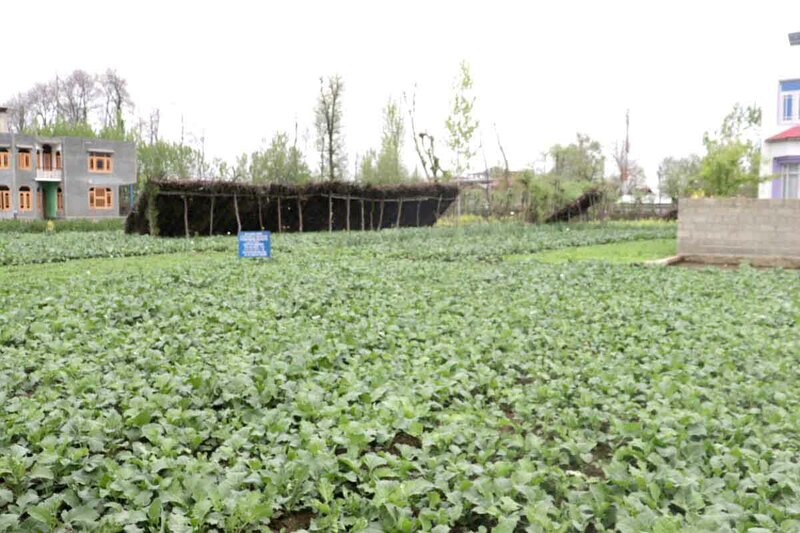 Almost all the 170 families, living in the village, are engaged in vegetable cultivation throughout the year. At any given point of time, men and women are seen working in their vast vegetable gardens. Interestingly, the residents who are landless also found the source of their livelihood from the same garden. Some work as employees and many others manage the allied activities of transporting or even selling the crop. It is around noon and Hanifa Begum, 65, is busy harvesting the palak. She grabs some bunches of spinach leaves, cuts them with her hand and places them in the Krenjul, a wicker basket. She is growing vegetables for the last 40 years, since her marriage. Her family owns 15 kanals of land on which only vegetables grow. This land feeds the family, the education of their children and all teh luxuries they have acquired over the years. Not everybody one sees in the fields is an illiterate peasant. Even well-read and educated residents follow the family profession. Shahid Ahmad has done his masters. He is the sole custodian of the family’s 5 kanals of the vegetable garden. It is the fourth year since he solely manages the fields. Shaheena Akhter is a graduate. Her father grows vegetables on 7 kanals of land. Being educated, she maintains accounts of their small vegetable business. “My father is illiterate but he works very hard in the fields,” Akhter said. “But he is not good at accounting so that I handle.” She said the vegetable cultivation is labour intensive and that necessitates the entire families to work in their fields. Senior residents in the village said they have been associated with vegetable farming for decades. Ghulam Ahmad Dar, 70, said even his forefather used to make their living by cultivating vegetables. The particular profession has given this village a specific lifestyle. In this village, the day starts long before teh first light. Waking up as early as 4 am they start to pick fresh vegetables from their farms for the market. By 6 am, slightly after the Fajr prayers, trucks start moving out of the village, some for the near-by market in the town and some for Jammu. Many villagers, however, use their wooden carts to ferry the harvest to the town. Lal Chowk in Islamabad, the main market of the town, witnesses an enormous flow of Sabzi sellers, in the morning. The crop is being initially being purchased by the wholesalers who later sell it to retailers. Bilal Ahmad, one major wholesaler in the town said while all vegetables grown by the village are good, there is always demand for one ites that comes from this village only: the Bangdarei Haakh. This has given the village a new identity. Bangidar literally means a field where cannabis is grown. The village grows almost all kind of vegetables on every inch of the land it owns. According to a vegetable development scheme introduced by the department of agriculture in September 2017, on an area of 150.35 kanals belonging to 94 farm operating families, every household generated an estimated income of Rs 2.5 lakh, a year. 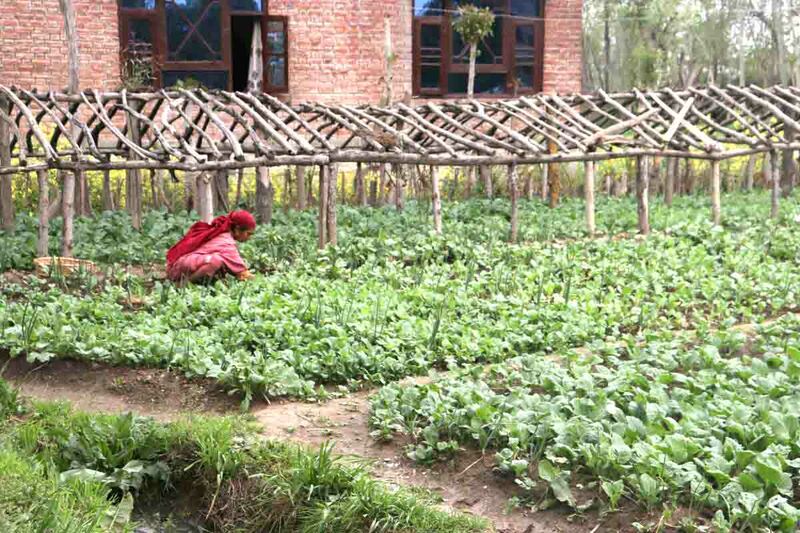 Over the years, the village has picked up the trade of growing vegetables during winters too. Almost every family has a greenhouse and some have many. The revenue generation for winter crops in the village was approximately more than Rs 50 lakh. Experts while hailing the fertility of the land in the village say that the majority of vegetables produced are organic and organic food appeals to the health of customers.